We are very excited to announce that following the success of #YouShape 2016, where over 20,000 young people and volunteers got involved, 2017 will see a whole #YouShape month held in February. Obviously Youth Shaped Scouting is about everyday Scouting all year round, but UK Scouting is focusing on February to really support young people and volunteers to embed this traditional part of Scouting into what we do and celebrate what are already good examples of Youth Shaped Scouting. We won’t be holding a national event like last year because this year is all about local impact and embedding good practice. Raise the profile and understanding of YSS across the organisation. We have set a target of at least 50,000 young people across 80% of Districts to take part in some way. Increase the quality and quantity of sectional Youth Shaped Scouting such as PL Forums and Sixers meetings where young people get to express their ideas and gain more leadership opportunities. Youth Commissioners working collaboratively with their Districts/Counties to embed Youth Shaped Scouting into the four areas of Youth Shaped Scouting: Programme, Leadership, Management and Governance. Work in partnership nationally to shape the future aspirations of the UK Scout Association. There will be information released over the coming months with more detail, ideas, suggestions and lots more but for now it’s about getting the ball rolling, starting to plan and making sure you have a team of people ready to make it a February that really have an impact. Consider your options and carefully make decisions on what your District/County will hope to achieve. One of the keys to its success will be making sure Youth Commissioners work together in Districts, Counties and Regions to plan, delegate and action what you want to see happen. Patrol Leaders camp for volunteers and PLs to come together. Run training on how to run successful Troop forums. County/District Youth Forum on tour, a team of young people could visit a large number of sections and support the leaders to hold youth forums. Executive training on Youth Shaped Scouting. Plan a youth shaped camp for your section. Week 1: design the programme. Week 2: pack and prepare for camp. Week 3: go on camp ran by the PLs for example. Week 4 review and reflect on how it went. 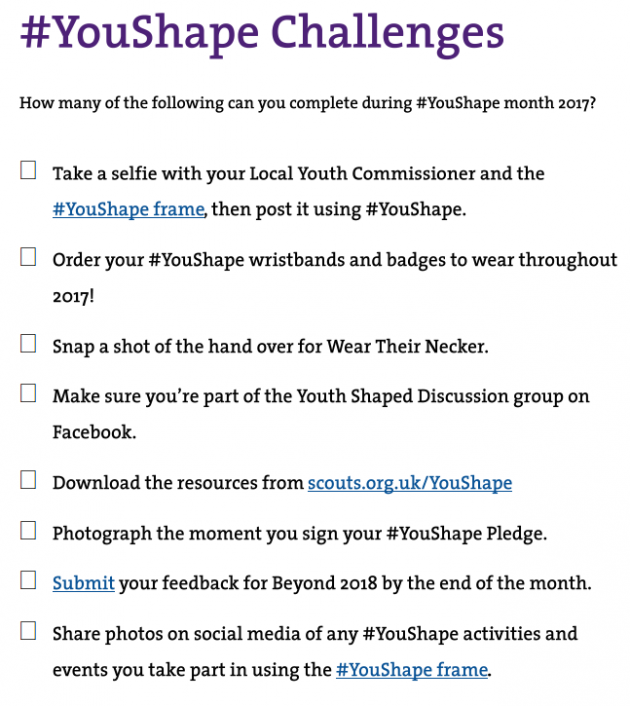 Host a Regional #YouShape event at a campsite or activity centre and engage with young people and volunteers on relevant topics. Work with the ADCs/ACCs to plan programme support days/evenings for leaders to find out more about running a youth shaped section. As you can see there are a wide range of options for success. We want Youth Commissioners to lead on the month, with support from their County/District/Area/Region to make it a success.